Up early this morning to make it into Victoria for our day trip. First stop was Leeds Castle. This very pretty castle has been a Norman stronghold; the private property of six of England’s medieval queens; a palace used by Henry VIII and his first wife Catherine of Aragon; a Jacobean country house; a Georgian mansion; an elegant early 20th century retreat, a hospital during WWII and different parts are set up to give insight into all of these. 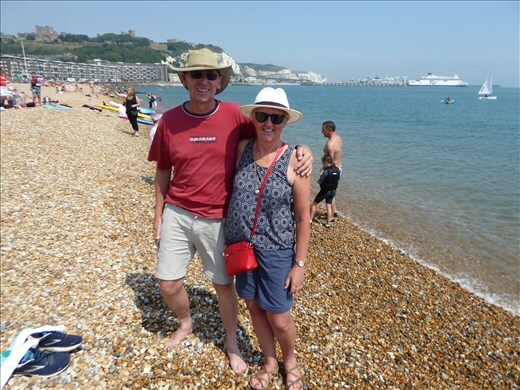 From there we headed to Dover, saw Dover Castle and drove around the white cliffs and were able to go paddling at the very pebbly beach. I really liked the cliffs but my favourite place for the day was the last – Canterbury Cathedral. We had a couple of hours in Canterbury so were able to view the cathedral which is in the middle of a large renovation, and then wander around the town which is quaint with narrow cobbled streets. Our guide Chris was great and gave lots of extra information on the trip. It was good to do the bus trip as we managed to see what the countryside of Kent is like. On the way home, it started to storm – lightning and rain. We managed to get home dry, but the temperature has dropped considerably to a normal English summer.